In this post I want to take a look at how you can use the typical average speed walking or hiking To estimate how long your planned hike will take. Before going into that in more detail I want to give some quick background on how this came to my mind for a post. I was taking part in a hike recently and the usual pre-hike questions were in full flow. The detail of this hike was shared with everyone in advance as normal. Typically this includes things like meeting point, start time, distance and so on. judge the average length of time for a hike. I knew what it would be myself but was a little surprised to see that quite a few folks couldn’t make a reasonable estimation off the top of their heads so thought it might be useful to add a brief post on estimating the duration of your hike when planning out your route. It’s a useful and simple enough piece of knowledge that’s not hard to remember or apply. As an aside, estimating the time duration of your hike should be a standard part of mapping out your hike in a ‘route card’ before you set out on a hike. Completing a formal route card is a good idea but you need to have the navigation skills to be able to follow it and so it’s perhaps for the more experienced /advanced hiker. Most hikers, newbies included, should be able to make a base estimation of time duration if they have some basic information like distance and so on. The most important thing we need to establish first is what is the average speed you will be hiking at!? This can differ a lot across many individuals. However when looking at estimating an average time, it is safe to use the average walking speed of a human which is about five kilometers per hour, which gives twelve minutes per kilometer. This average is of course based on normal flat ground so you could argue that this would be incorrect for hiking as you will be going across more difficult terrain and going up. That is considered further on in the calculation but even with people of different hiking speeds, it is safe to use the average of twelve minutes per kilometer. I should add a note here that no direct consideration is given for speed gains going down. Savings in time, due to a faster pace across flat land or going down, are compensated for by losses in time, due to a slower pace across more difficult terrain. In short, the average works out fine. If you want to get an even more precise time, you then add in the next two items. When hiking, altitude of course comes into the equation as you will likely be ascending upwards as you progress throughout your hike. You of course go slower when going up so that needs to be factored in. Allow 1 minute for every 10 meter rise in altitude. Now, you do need a bit of experience to be able to work out more exact distances in height from a map. Good maps will have contour lines, see the green arrow pointing to a contour line in the image below, which indicate the shape of the land but also use a standard height distance between them, e.g. 10 meters, to indicate altitude. Count the contours and multiply by the distance between each contour and you have your height. Contour distance does vary from map to map though so you need to figure that out. Now, that may sound complex, especially to someone new to this but any good map should also have some numbers on it. These numbers are usually at height intervals on the contour lines e.g. every 50 or 100 meters. You can use these to get a basic idea of height by finding a number close to where you’re starting and one close to where you’re going. Finally, as mentioned above, you will also encounter difficult and tricky terrain and maybe end up going a little bit sideways or something like that. To help allow for things like this, add an additional bit of time, say 10 minutes, for every hour from the total of the first two parameters. This can vary but 10 minutes is a reasonable rule of thumb for a group hiking at a reasonable pace. Total Time: 200 minutes or 3 hours and 20 minutes. So there you have it, not too difficult at all to make a decent estimation of how long your hike should take. I should mention that the parameters listed out above are based on something called Naismith’s rule. It is the commonly accepted method to estimate duration. It’s worth noting that this is far from an exact science and I typically find the time given here quite generous. There will of course be difference’s for very fit people or if a group is moving at a very fast pace. Also, terrain can also play a significant part and so there are more advanced calculations within the rule, and extensions on it that other folks have added over time. Even with that, it is never precise. However, from my experience, the above works pretty well to work out an average duration of a hike going at a standard pace. You can of course play with it to see what works best for you but it’s a handy and very easy piece of knowledge to have and to remember. In the last few weeks I was looking at hydration packs in a fair bit of detail. In one recent post we looked at what to consider when buying a hydration bladder and in another I touched on my hydration bladder of choice at the minute. When looking at what to consider when buying a hydration bladder, one of the key things listed for consideration when buying one, is how easy your chosen hydration bladder / reservoir is to clean. This has a lot to do with the design of the bladder and what you use it for. 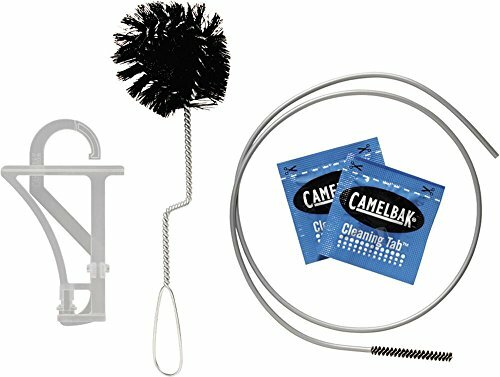 Pictured above is the Camelbak AntidoteTM Cleaning Kit, click on the image to learn more. When considering design, you have the Ziploc or Screw Top options. Both can work well in the context of cleaning. In my opinion a Ziploc is easier to clean as you can open the whole reservoir wide open but in the past I didn’t have too much trouble cleaning a screw top hydration pack either. The relevance of cleaning is also impacted by what drinks you’re putting into your hydration bladder. I only ever use mine for water so I am not adding anything that can leave sediment that can turn into various biological nasty’s over time. However, you may want to use your pack for another type of drink aside from water so I want to take a look at some tips on how best to clean your hydration bladder as well as possible. Even if you just use water, bacteria from your mouth can get onto the bite valve and into the tube so you do need to clean it even if you’re just using water. It is recommended that you clean your reservoir after every use. I have to be honest and say that I do not do this and think it is a bit over the top. As mentioned, as I only use water in my hydration pack I don’t feel the need to deep clean it after every use. I feel a good rinse out with water is enough and I add light soap into the equation every so often when I rinse it out. I always pay a bit of extra attention, when I rinse it after every use, to the bite valve as that’s the piece that goes into my mouth. The bite valve usually hangs loose out in front of you as you hike so it can easily get dirt onto it when you take your pack off and put it on the ground, say when you stop to sit down and have lunch. With that in mind, I always give it a good rinse out every time after using my pack. Tip: when you’re drinking from your hydration bladder while hiking, it can be a good idea to rinse the bite valve in your mouth with some water from the pack. I know it doesn’t sound too pretty, but do a couple of swirls of water around the valve in your mouth and spit the water out. It can help to remove any dirt that may have got on to the bite valve while out on your hike. However, if you’re using other drinks in the hydration bladder, I think a good cleaning after every use would be required. It’s worth noting here that there are specific cleaning kits, like the one pictured above, which have brushes, solutions, etc. that you can get which are designed to help you clean your hydration bladder. However, these aren’t always necessary and I think they’re probably of more use on a less frequent occurrence i.e. when you need to give your bladder a really deep clean every so often. On a medium term ongoing basis (after 10 to 20 uses), first off, I clean my pack by filling the reservoir / bladder with a mixture of water and two or three denture tablets. I started to use denture tablets after I found them to be very effective for cleaning my thermos flask. I found They gave a great clean and left a nice freshness behind them after the clean. Makes sense as they’re used to clean dentures after all. You can also use hot water and baking soda instead of denture tablets, two or three tablespoons should be enough (as with the pack cleaning kits, you can get specific cleaning solutions for this very purpose too but denture tablets or baking soda should work fine … denture tablets are my preference). To be sure you get the mixture into the drinking tube, you will need to activate the drinking mechanism by biting on the bite valve at the top of the tube. This will fill the tube up with the cleaning water. You don’t need to put the bite valve into your mouth when doing this. You can usually just pinch the valve with your fingers over the sink and that should be enough to get the cleaning water flowing through. If not, you may need to angle the reservoir in such a way to get the water flowing e.g. hold it up so gravity helps the process. When the solution is filled into the tube, let the solution settle and leave it in the reservoir and tube for 30 to 40 minutes. Then pinch the tube a bit to empty the water in the drinking tube and let a fresh flow of cleaning water fill the main reservoir. Move the whole bladder around a bit more to move the water in the main reservoir a bit and then leave for another 30 to 40 minutes. When ready, empty the solution out of the reservoir and rinse the whole reservoir and tube with hot water. You can use a mild soap too if you like but the main goal is to ensure you rinse all the denture / baking soda cleaning water out of the reservoir. Rinse as many times as you need to, to do this effectively. When finished cleaning leave your hydration bladder / reservoir in such a way that it can air dry. As best as possible you want to enable air to circulate throughout the pack to prevent any moisture staying in the pack which could form mold. When I’m drying my Platypus Big Zip Lip LP Reservoir, pictured above, I slip the sliding plastic seal, the dark blue piece at the top of the pack in the picture above, between either side of the top of the bladder. This leaves the top open and so air can get in. It’s also a good idea to come back to it after a day or two and empty it again just in case a little pool of water has gathered somewhere in it. It also moves the bladder itself a bit and so lets air in to places it maybe wasn’t getting into (sometimes the sides of the pack will stick together in spots while drying). After that, put it back into the drying position with the sliding seal between the top ends of the bladder holding it open. Some cleaning packs, like the one pictured at the start of this post, will have drying arms which can be used to hang your pack in a specific way to help and speed up the drying process. Not a necessity I feel but no harm to use if you have them. So that’s that. These easy steps will help keep your hydration bladder usable time and again well into the future. Even if you only use your pack for water, I recommend you give it a good rinse after every use and a deep clean every 10 to 20 uses following the steps above. I have to admit that I may be a bit lazy in comparison to others when it comes to cleaning my hydration bladder but I only let myself away with that as I only use my pack for water, nothing else. If you use your pack for fluids other than water, definitely follow the steps above after every use. It will ensure you keep your pack free from anything growing in it that shouldn’t! You need to make the call on that for yourself though. It will depend on a number of factors such as what you’re drinking from your reservoir, how often you use it, if you have a clean freak disposition like Monica from the sitcom Friends, etc. If you’ve any questions on any of this, feel free to leave them below. I hope you found this article useful. Do you have any tips for cleaning a hydration bladder? I’d love to hear about it in the comments below. What Is The Best Moisture Wicking Material? I was recently on a hike and I was talking with a fellow hiker about keeping yourself warm but dry when out on the trail. They happened to be wearing a cotton tee as a base layer and so they weren’t the most comfortable as we had just finished a rather steep climb. Needless to say, their cotton tee was damp with sweat and of course cooled down as we hit a lighter pace. Not the most comfortable place to be in, especially in winter, that’s for sure. As we discussed this I suggested to them that they should get some base layers and tees made from material with good wicking capabilities. I pointed to my North Face Crew Tee which I was wearing at the time. They were a bit confused as they didn’t know what I was referring to when I mentioned ‘wicking’. I of course then started to explain what I was referring to. Later when I got home I thought about it some more and realized that wicking is referred to throughout the site here on several posts, and while we may have given a cursory and brief explanation about what wicking is, we thought it might be useful to delve into the subject in a bit more detail for clarity. In particular, to review what is the best moisture wicking material. Wicking, when used in the context of clothing fabric, in the easiest way I can put it, refers to the ability of that fabric to move moisture away from the body and the fabric itself. This can help keep the body dry and cool even when the person sweats from exertion. It’s worth noting that many base layers can also act as a very good insulator too so it’s worth keeping that in mind when choosing the kind of base layer that best suits your needs. Wicking works by utilizing a thing called capillary action. This means that the fabric is made up of tiny little tubes, like capillaries in your body, that the moisture can move up into, away from your skin and released into your outer layers of clothing or the air. If you think of a wick in a candle, think how the wick draws the wax up the wick to the flame to be burned. The principle of wicking fabric is pretty much the same. You are on the trail wearing a wicking base layer. You start to sweat and so you create an environment of high humidity between your skin and your shirt or tee. Sweat moisture begins to gather on the underside of the base layer. This high humidity, or wet air, close to the skin will then try to move towards a lower humidity environment where the air is dryer. Wicking fabric helps all this to happen as the fabric make-up encourages the moisture to move along the fabric, the aforementioned capillary action, to the outside where it can spread out and evaporate when it finally reaches the lower humidity on the outer layer. Wicking fabric, means that the fabric has tiny capillaries in it which are large enough to let moisture, like sweat, be pulled away from the skin and out and away. Wicking fabric is used in all manner of outdoor activities from running to hiking and is used across all seasons but is particularly effective in colder temperatures. It can act as a good insulator, in terms of heat, too. Base Layer – The layer closest to your skin and so where wicking capability is most needed. You want to let moisture, sweat, be able to get away from your skin but also have a layer element of insulation to keep heat in. Note: layer’s can sometimes be optional as they may not be needed depending on the temperature. On a scale of one to ten for the best functional materials for wicking, with one being bad and ten being good, I would place cotton sitting at one. Definitely a no-no right next to your skin, and for hiking gear in general, as it absorbs moisture and so keeps it next to your skin. However, it is worth noting out that in certain conditions and in certain climates, like a desert, cotton can have an advantage in that the retention of moisture helps keep your body cooler for longer. That’s an exception though. On the good end of the scale at a nine or ten you have synthetic fibers like polyester, polypropylene and natural fibers like merino wool. For base layers I use both ones made from synthetic based fibers as well as ones from merino wool, or a combination of the two to try and get the best of both worlds. The table below ranks out some of the common materials that tops, tees and base layers are made from, in order of their wicking capability, at least how we rate them. Note, some materials in certain circumstances can have an advantage over others in certain circumstances, which we explore a little more below the table. Merino Wool #1 *Our top choice! on the construction, weave, etc. *Typically requires a lot of TLC as a material e.g. I find base layers and tees made from synthetic fibers easy to clean and they have a very quick drying time. On top of that they are also very lightweight and packable. On the downside, they can hold body odor more than merino wool but for me personally, this has never been a major issue. It’s worth noting that merino wool acts slightly differently than the synthetic fibers in terms of wicking. merino wool, which comes from merino sheep, is much softer than standard sheep’s wool. It can absorb some moisture into it’s fibers while still being able to breathe well, while also acting as an excellent heat insulator, holding heat within the fibers at the same time. Merino wool can also be better in terms of odor as it can fend of bacteria better than synthetic fibers. I got my first merino wool base layers only quite recently as I was previously more than happy with what my synthetic polypropylene ones had to offer. However, after I started using merino wool base layers this winter, I have to say, I am a major fan! The merino base layers feel excellent against the skin, that bit smoother and more comfortable. It also really does feel that bit more toasty and snug in merino wool than a purely synthetic base layer. I still use my old synthetic layers as well as the merino wool ones as I think they both have their own merits and special capabilities to offer (As mentioned in the paragraph above re: certain circumstances where one may be better than the other). The Meriwool men’s merino wool midweight baselayer Crew is a very functional and affordable base layer, an excellent choice for the trail. Buy the Meriwool men’s merino wool midweight baselayer on Amazon now! So that’s it for today. A short post but hopefully an informative one if you’ve been wondering what all this talk about ‘wicking’ is about, and what the best moisture wicking material is! Hopefully it at least gives you an idea of what it is and how it works and what to look for. If you’re planning to do a lot of hiking, or any outdoor activity, all year round, it’s good to be familiar with what wicking is. If you need base layers, you should look for gear made from material that has good wicking capabilities e.g. polyester, merino wool, a mix, etc. I recommend trying a few different base layers and so on out, and see which one suits you best for your needs depending on the activity you need it for. What are your base layers made from, synthetic materials? Do you prefer merino wool? Hiking in wetlands can be quite the challenge. Being from Ireland, I am of course quite familiar with this type of terrain as we get lots of rain. There are many places in Ireland and close by in the United Kingdom that have wetlands. I have hiked in the types of terrain listed above many times. Usually it will be specific parts of hikes that will be particularly boggy or marshy although you can come across areas on the trail that are too deep to even attempt crossing. A full on swamp is a good example of this, not a place to be hiking in but you may well hike around the periphery and so you will encounter swampy and marshy bits. Generally speaking, wetlands get harder to negotiate as the seasons get colder and wetter. The ground tends to get even more saturated in places in the autumn and winter and so it increases the effort you need to expend to cross it. It’s funny as sometimes I think we don’t give marsh, bog, etc. it’s due respect as I do find it can be very arduous and tiring to hike in and it adds an extra level of difficulty to any hike. On a recent hike I had to cross some very marshy areas and it felt like I was nearly wading through quicksand! My legs were knee deep at times in places and the sheer effort it took to pull my legs back out while I hiked, if you can call it that, across the boggy and marshy ground was very tiring. Usually accompanying the negotiation of this type of wetland terrain, in Ireland and the UK for sure, in the colder seasons is wet and inclement weather so I find that hiking in marsh and bog-land in cold wind and rain is a definite challenge. I know a few hikers who I would consider pretty hardy but they have no time for hiking in this type of terrain. I think it is the type of terrain that can bring out the kind of love / hate reaction. Some people love hiking across bog and moorland while other’s just can’t stand it. However, in saying all this, water will of course freeze if it’s cold enough so you can end up walking over quite icy surfaces, even in bogs and so on. This can work both ways and be to your advantage or disadvantage. I’ve been out on a crisp and icy morning hiking across bog in January and as it is frozen, it is actually quite easy to walk over and much more pleasant than having your boots sink deep into it as they normally would. However, you need to be careful too of course. The ground is of course more slippy so there’s more risk of you taking a tumble on an icy patch. Something to be wary of for sure. Another tricky thing I find hiking in this type of environment is keeping your feet dry. Even with the right hiking boots, gaiters and hiking gear on, if your leg regularly get’s submerged in marsh or bog up to your knees, you have a real battle on your hands to try and keep your hiking socks and feet dry and, of course, warm. To hike in this type of terrain and environment good waterproof hiking boots are a must. You will definitely need gaiters and also good waterproof rain pants. A waterproof hiking jacket is also a must as these areas are prone to heavy and regular rainfall. A final note is on the clean-up afterwards. Cleaning up your hiking gear, in particular cleaning your hiking boots, after hiking in wetland type terrain does sometimes take a bit more work than many other environments as you’ve a tendency to take some of the bog etc. back home with you on your boots! Also, it is a good idea to clean your boots and gear at the nearest available opportunity after hiking in bog and marshland. While this is a good general rule anyway, due to their special nature, some wetlands, like bogs, are more acidic and so can dissolve seals and binds on your hiking boots and gear if you not washed off with water. Now, I don’t mean to knock bogs, marshland, etc., they have their own special type of beauty but they can be challenging to hike in. So, as always, be sure to prepare yourself appropriately before setting out on your hike if you’re venturing into wetlands and always wear the right hiking gear. Going into a wetland with the wrong gear on will at best be unpleasant and at worst potentially a disaster. If you’re going into a wetland area for the first time be sure to do your research and find out what areas are safe to hike in. Hiking in protected areas gives the hiker a large and varied selection of great hiking opportunities. For many hikers, going out into the wilds and mountains isn’t high on their list of to-do’s. While some, like myself, love to push the boat out and truly get out into the lesser known wilds, for many this just isn’t enjoyable and they’d rather stay within well known and protected areas. These types of areas are usually very well managed and looked after and so have lot’s of amenities, man-made trails, etc. Today I wanted to take a look at some of the many and varied options available in this sphere. Right at the top of the list is of course National Parks e.g Yosemite in the U.S., the Alps in Europe, etc. Most countries have their own designated national parks which are will vary in size and function. Some will have plenty of hiking trails clearly mapped out for your enjoyment while others will be more rugged and untouched, most will have a mix of both. National parks are usually always areas of outstanding natural beauty so its more or less guaranteed that you will get to hike in some of the most majestic and beautiful scenery in the area. Some National Parks require permits to hike in them and busier times of the year, these can be harder to get and limited to certain numbers, so be sure to check in advance to not be disappointed on arrival. These are usually a lot more available than national parks simply because there are more of them. It is quite common to find smaller forest reserves on the outskirts of cities. The nature of these locations can vary significantly. For example, some forests may be used for commercial purposes and so active forestry management for lumber may be ongoing. Therefore related activities will be happening e.g. chopping down trees, etc. Forests do provide their own unique beauty to hike in and a hiker can easily lose themselves in the varying types of trees and shrubs. Personally, I find that you can really get the feeling of getting away from it all hiking in a forest while you’re still right beside a city and I find the forest doesn’t even need to be that large to have that effect. When you’re surrounded by trees it’s like you’re a million miles away from the hustle and bustle of the city that may only be a few miles away. Of course, it can’t take the place of the wilderness and the mountains, but it still can be very enjoyable to hike in. More for the advanced hiker, wilderness areas are similar to national parks, and can form part of them, but are usually much more extensive. Therefore, good navigation, mountaineering and outdoor skills are essential if you’re not hiking with a qualified and experienced guide. These areas are protected so no commercial activities, e.g. mining, should be happening. These area’s can also have extensive trail systems but are more often than not a mix of trails and rugged untouched terrain. Can be a real thrill to hike in! The primary aim of Nature and Wildife Reserves is to provide a protected area specifically for wildlife however many of these areas do also cater for hikers and so will have specific hiking areas and trails. As a general rule, day hiking will be the most you could expect in these areas as they will likely have quite strict rules about camping and many of them simply don’t permit it so always check in advance. The above are some of the types of protected areas that are available to hike in. Most countries will have some or all of the above. You can check out whats available in your country or more specifically near you with a simple Google search. Many times protected areas will also be intermingled with beautiful old villages, towns and land features that are a joy to come across as you hike around. You will likely be surprised at the little gems that either aren’t too far away or are right on your doorstep. While it is unlikely for you to have a vast wilderness area close to your city or town, you could very easily have nice forest reserves or wildlife reserves quite close by. I hope you found this short post useful. Local Hiking Clubs Are A Great Resource For Hikers! In this article I want to take a look at local hiking clubs, as they are a great resource that are available to many folks in their local areas. When you are starting out hiking, it can all be a bit of a mystery. Where do you go to hike? What should you bring? Who should you go with? How do you stay safe? There can be a lot of things to consider for sure. For people just getting started in hiking, joining an established club is a really good idea for many reasons. For more experienced hikers, joining a local hiking club can also be a great idea for multiple reasons. I review some of these reasons in the sections below. Most hiking clubs will cater for all types of hiker and therefore all levels of fitness. To help them organize folks and to get an understanding of the fitness levels people have when they start, they will generally grade their hikes. Grading simply means that each hike is awarded a grade based on it’s level of difficulty. So based on a scale of 10, an easier hike will have a lower grade of say 1 to 3 while a harder hike will have a higher grade of say 8 to 10 with medium hikes sitting between 4 and 7. The grading will be based on things like distance, altitude, terrain, and so on. The general idea of this is that when you’re trying to organize many hikers into manageable groups, you want to be able put people of the same fitness levels on the same grade of hike, so they can all keep up with one another. This grading system can also be very useful for someone completely new to hiking, as they can get a taste of how they handle a proper hike but at a suitably basic level before going further. Regardless of your hiking experience, when joining a hiking or walking club, a lot of the time you may be asked to start off on a low or medium level hike. Please don’t be offended if you’re super fit, it’s just the easiest way for a club leader to get an idea of your fitness before allowing you on harder hikes. Note: hiking can be funny in that you could be quite fit in a particular sport, but your specific fitness skills may not apply to hiking and you will still need time to adapt to that type of activity. A lot of the time, when you head out hiking you are going to places that are outside of built up areas like cities and towns. Therefore you need transport to get there. Many clubs will organize transport for their members, for a small fee, that will pick up people from a particular point and bring them back when the hike is finished. Also, even for things like car pooling clubs are really great. There’s no point four people from one area all driving their own cars to the hiking location if they can all pool together. Not only does it save on fuel costs but it will of course be better for the environment. Often times, car parks at hiking locations can be quite small, so the less vehicles that are there, the better. Another great advantage of hiking with a club is that the hikes are all organised in advance by an experienced hiker. Usually there will be a Group Leader of some kind who will have other one or two helpers. Generally these are volunteers from the club who take turns organizing and leading or supporting the hikes. For a newbie this is great as your hike will be all mapped out well in advance. These volunteers will also generally be experienced hikers who have good navigation and mountaineering skills. It also should give you a selection of hikes to pick from, as many groups plan their hiking schedule well in advance. When you join a club of any kind, you of course get the benefit of years of experience from all the other members. If you have any questions about hiking be it about what are good hiking boots to get or what food you should bring on a hike, you will get the best answers and guidance from your hiking club comrades. It never ceases to amaze me actually. I have been hiking for years and I still regularly meet folks who teach me a thing or two. For example, hiking gear is always changing and, generally speaking, getting better and better in terms of function and so on. I find many people can give me good recommendations from their experience with gear and so on. As well as that, I regularly pick up a new hiking tip or general recommendation from other hikers. When you join a hiking club you will of course meet like minded people. If you are interested in hiking you are likely a big fan of the great outdoors in general and probably like to dip your toe’s in the water for some other outdoor activities be it rock climbing, fishing, etc. When you join a hiking club you will be meeting and socializing with like minded people, who are likely interested in similar things, so the possibilities are endless with regards to where it might lead you. Aside from the possibilities of other outdoor activities, most clubs will organize hiking trips away or social nights out for dinner or the like, so there are many, many, opportunities for fun to be had. In conclusion, whether you’re new to hiking or have done it before, but would like to expand on your experience, joining a hiking club is a fantastic way to go about it. There are many benefits and I have only listed a few of the main ones above, there are no doubt many, many others which I have not touched on. To find a hiking club, simply go online and type in ‘your area name’ and ‘hiking clubs’ into search. That should do the trick. Most towns and cities will have plenty of hiking groups and remember you’re not limited to joining only one, you can join as many as you like. Also, meetup.com can be a great place to find a local hiking group too. Again, just use the same search criteria on their website. I know of several excellent ones from my city on it. One final thing to mention is that some hiking clubs will have a fee to join. This is usually a minimal fee of twenty or thirty bucks for the year, to cover general admin costs for the club. All perfectly reasonable and when you sign-up, the items that make-up any membership costs are usually explained in detail, so you know what you’re paying for. I hope you found this article useful and informative. Please like, comment and / or share. Before looking at altitude sickness in terms of treatment and prevention, let’s first take a look at what altitude sickness is, and it’s signs and symptoms. As with any serious condition like this, it is good to know what to look for in case of a developing emergency while out on your hiking adventures. Altitude Sickness occurs when the human body is exposed to high altitudes with low partial pressure of oxygen. Typically it starts to occur above 2400 meters (8000 feet). One of the key problems with altitude sickness is that there is, as yet, no way to tell if someone will succumb to it. That is, you can take two people of equal fitness levels, health, etc. and expose them to high altitude. One will succumb to altitude sickness while the other will not with no identifiable reason as to why it hits one and not the other. Broadly speaking the initial symptoms of altitude sickness can feel like a bad hangover or the flu. However symptoms can become severe and life threatening if not dealt with appropriately. Symptoms are categorized as primary and severe with primary symptoms being present in the initial onset of altitude sickness, and severe symptoms setting in with prolonged exposure and where no remedial action has been taken. If someone is entering the early stages of altitude sickness it is important to take remedial action as soon as possible. This is looked at in more detail below. Treatment is reviewed in more detail below but as both HAPE and HACE are life threatening, the act of moving to lower altitudes may help to save anyone afflicted with either condition. Note: On a previous post related to hypothermia I mentioned the mumbles, fumbles, stumbles and grumbles. They are signs to watch out for, for many conditions and they apply here too as an indication that something may be up! As mentioned above, there is no way to tell if someone will succumb to altitude sickness or not. However there are certain things you can do to try and best prepare yourself for higher altitudes. As with any of these things, prevention, where possible, is better than ever getting into the situation in the first place. While it is possible to take some specific medications which may help prevent you from getting altitude sickness, these are generally only ever advised when someone has no other choice but to ascend high altitudes at a fast rate. Generally speaking, acclimatization is the preferred method of altitude sickness prevention. To prevent altitude sickness from occurring, in the first instance, you should always ascend to higher altitudes (above the danger level of 2400 meters / 8000 feet) slowly and avoid any activities that will stress the body in the first 24 hours at the new altitude. It is best to avoid alcohol or anything that will dehydrate the body as that will only serve to exacerbate any potential problem. Logically following on from that, you should try and stay as hydrated as possible while you acclimatize. When moving to very high altitudes on an ongoing basis, hikers and climbers may use the ‘climb-high, sleep-low’ approach. This refers to ascending a certain distance during the day and then coming back down a percentage of that to sleep at night. The recommended altitude increase in one day is 300 meters. Therefore, as an example, if starting on a given morning from 4500 meters and ascending to 5500 meters, you would then come back down to 4800 meters to sleep. You would then continue on in this vein as you ascend further and further up. Most people will have heard of ‘base camps’ the most famous probably being the North and South base camps at Everest. The North base camp is located in Tibet at 5150 meters and the South base camp in Nepal at 5364 meters. A key function of base camps is to help assist with the acclimatization process. If you’re unfortunate enough to find yourself in a position where someone in your party is getting altitude sickness, the first thing to do is to descend to a lower altitude. This is the only real way of dealing adequately with the problem. If however you can’t descend, below 3700 meters you can try to administer oxygen for mild to moderate symptoms. In short, there is no good way of dealing with the problem while staying at the same altitude that is causing the problem. The affected person needs to be taken down to lower altitudes ASAP. This is of course not always possible e.g. if the weather does not permit. In extreme situations or if you’re ever unsure what to do, call the emergency services if you can, to ask for advice and guidance. To date, the only hiking trip I have been on was where altitude was potentially a problem was when I climbed Gran Paradiso and Mont Blanc in the Alps. Mont Blanc rises to 4810 meters so the risk of altitude sickness was very real for me but luckily I got on fine. I of course spent time acclimatizing before I ascended and I whad expert guidance and training so all the necessary precautions were taken. Even with all that though, Altitude sickness could still have happened. Even though I didn’t succumb to it, I do recall feeling a bit funny when we reached the top of Mont Blanc. While I loved standing at the summit enjoying the view, I was happy enough to start to descend after 20 minutes or so as I did feel a little odd and my hunch was that it was altitude related. It’s worth noting as well, that one of the experienced Alpine Guides we had, told me that he had summited Mont Blanc dozens of times and never had an issue with Altitude sickness. Then one day, as he did his normal hike to the top with a group, he suddenly felt terrible, doubled over and started to throw up! Even for an experienced guide like him who had been at that altitude many times before, it can still just happen. As mentioned repeatedly above though, you just never know who or when someone may or may not be impacted so you need to keep a close eye on it to be sure. Finally, this is not an exhaustive explanation of Altitude Sickness or the varying problems it can cause. Rather, I hope that this has provided a useful introduction to help generate awareness. Educate yourself as much as possible on this subject especially if you plan to take your hiking adventures above 2400 meters / 8000 feet. Note: If you’re planning to ascend to dangerous levels, always ensure you get expert training, I highly recommend professional guidance and assistance as best required. Keep you and your hiking friends safe while hiking high! Stay safe! I hope you enjoyed this and found it useful. Please like, comment and / or share. In a post I did a couple of weeks back I looked at what to think about to help you try and decide whether you’d like hiking as a pastime before committing to it on an ongoing basis. To continue in that vein, I wanted to have a look at some creative ways you can put this trial into action! Well, not everyone has easy access to mountains or even the countryside. As many people live in towns and cities, sometimes transport out to hiking locations is at best infrequent if not non-existent. However, this doesn’t spell the end of temporary possibilities to keep you going while you wait for those weekend days away in the mountains. As with anything you can get creative and many towns and cities offer different and alternative hiking possibilities. Many cities have canals and rivers running through them. These can, although not always, be a really nice place to go for a long trek. Generally speaking, while not getting totally away from the city as such, you should be able to get yourself into an environment where you’re surrounded by the trees, a bit of wildlife and the soothing sound of running water. Not exactly open mountains but still pleasant all the same with its own set of unique and admirable qualities. Most cities will of course have public parks which can be a welcome oasis in the hustle and bustle of day-to-day city life. You can take advantage of these to get your legs out for a good stretch. For smaller parks, you’ll of course have to walk around them a few times to get a decent hike type walk in, but that’s cool. It’s enough to give you a flavor if you’re just trying walking and hiking out for the first time and it is also enough to dust the cobwebs off from a physical workout perspective. They do say that only thirty minutes of walking a day will be a great help to you to stay healthy. Many cities are on the coast and the beach offers a perfect place to get a good walk in. If you have one close by, you are laughing. Personally, if asked the question if I prefer mountains or the sea, I would say it’s a close tie for me. While I love hiking in mountains, walking along a beautiful beach is hard to beat. If I can hike along a mountain along a beach, then that’s just perfect! Anyway, a beach is a great place to get out for a good long walk and with the added benefit of a fresh sea breeze. Good for the body and good for the mind so you’re on to a winner! Often times, you can find a small forest area close by your town or city. These are perfect locations to nearly immerse yourself in nature and the outdoors and get a real feel for what hiking is like. You don’t need a huge area of forest to really feel like you’re in the wilderness, a couple of square miles will do the trick nicely. Finally, I wanted to give a nod to country roads. Often times, people may not be based in cities but rather smaller towns but not necessarily with any hills or mountains close by. Sometimes, just getting out on the local roads and walking alongside the fields and countryside can be really pleasant and again, will get the legs moving and give you a feel for what hiking in hills and mountains might be like for you. Of course remember that if you’re planning on hiking on roads, always wear appropriate reflective hiking gear to ensure you can be seen by other road users. Hiking is of course best experienced in the mountains, hills, etc. but many times, it isn’t easy for folks to get to those hiking locations to enjoy them. As shown above, all is not lost and there are other options that may be open to you, at least as a short term substitute. Have a look round your town or city for any of the suggestions above and get yourself out and about, you never know what hidden gems you might find. It will not only serve as a reasonable introduction to help you gauge whether you want to take your hiking adventures further but either way, it will help you stay fit and healthy. A good walk is great for your general well being not only physically but also psychologically. After a hard day at work some fresh air in natural surroundings can really work wonders for your general mood and orientation. How Do I Know If I’ll Like Hiking as a Pastime? If you’re completely new to hiking, you could be asking yourself some questions. for example, ‘how do I know if I’ll like it?’ ‘Is hiking a pastime I want to get into?’ It makes sense for this to be the first thing you consider. Like any hobby or sport, it’s always best to give yourself a trial period at it to see if you’ll actually take to it and want to continue with it on an ongoing basis. Everyone has had the experience of starting some kind of new sport or activity with gusto and excitement only to see the initial enthusiasm dissipate and wane. A classic example of this is the Gym membership. How many gyms make consistent money from folks who never actually use or even visit their gym? If you’re nodding your head in knowing acknowledgement 🙂 trust me I know, I have been guilty of that one in the past myself, and isn’t it strange how the months drift by and yet you still don’t cancel the membership!? Like there’s a sub-conscious fear that if you cancel you can never join up ever again! This type of thing is very common and ultimately not necessary. Like anything some sports or activities you will try and you will love for life while others will come and go at different times of your life e.g. as you grow older or your tastes change etc. Hiking is no different. For me, hopping about mountains in the elements is a pastime I truly love and enjoy but for other’s this may be as pleasurable as getting teeth pulled! Do I like, or at least think I would like, walking about outside in nature and the elements? If your answer to this question is yes, you’re off to a good start as far as hiking goes. Next, when you have an initial inkling that you might enjoy hiking, ideally you want to get a feel for it first before committing to it as a regular activity. Why is it good to get a feel for it first? The main reason is that good hiking gear can be a relatively significant investment, depending on how far you want to go into hiking of course. While not quite as wasteful as an unused gym membership, for example a hiking rain jacket can be used for normal day-to-day purposes, you may not want to be purchasing some of the more hiking specific kit at the start when you aren’t sure if you will commit to it on an ongoing basis. This is easily solved by introducing yourself slowly to hiking and building on it bit by bit to see if you’ll take to it. If you’ve never ever hiked before but think you might enjoy it, just start out walking in your local parks and see if you like that. After doing that a few times till you’re comfortable, push the boat out a bit more and maybe head off to the countryside to a well-established but relatively easy trail. From there, if you’re still feeling the love, you can move on to bigger well established trails on hills and mountains, eventually extending your shorter hiking excursions out to day hikes. The beauty of all this is that you can go through all the above with most of your normal clothes and a good rain jacket, hiking pants and hiking boots. These items are things that you can use for multiple activities so even if you invest in them just to try hiking out and find you don’t take to it, they are still useful pieces of kit to have for your normal day-to-day activities. That is, rain gear will always come in handy somewhere along the line. As well as that, aside from getting to good places to go hiking, hiking is completely free. No monthly hiking membership required! So you don’t need to fret about paying for something you’re not using. Hiking is a great activity that has many benefits and if you’re looking to take up a new sport or activity, it could be a good one for you to try. Keep in mind that no-one wants to pay for an unused gym membership so transferring that to hiking, there’s no need to buy the top of the range gear in a fit of newbie enthusiasm! Remember that you can test the water first and if you’re sensible about it, you can get started with stuff that, even if you don’t stick with hiking as an ongoing activity, is still useful on an ongoing basis. Then, if you do stick with it and find you like it, you can expand your hiking gear list slowly over time as you need to based on the adventures you plan to undertake. Personally, I think you’ll love hiking if you give it a go so no stalling and get yourself out there! I might be biased though 😉 If you’re completely new top hiking but want to get started, I recommend checking out the free beginners guide. That covers just about everything you need to think about to get you started on the trail.